EasyCore is an easy and fast digital core description solution, for both clastic and carbonate sedimentologists, designed to speed up the core description process by automating parts of the workflow and still keep a design that is pleasing to the eye. Core and core data is a valuable asset and an integral part of the exploration business. It contains important information necessary for petrophysical analysis, depositional modeling, static modeling and reservoir quality modeling. Exploration risk is directly impacted by the use of core data. A publication by Reynolds (1999) demonstrated a profound link between the amount of core data utilized and drilling well success as measured by NPV. The top risks related to drilling basins are reservoir presence and quality, both of which cannot be evaluated properly without core description data. 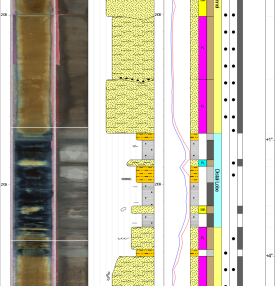 EasyCore allows the sedimentologist to design detailed and accurate logs from core or outcrop data, incorporating features about the depositional environment from grain size, fossil content and minerals to sedimentary structures. Get better utilization of core logging data in E&P activities. Cut cost of core logging, increase quality and speed up the process of core logging. ..and thereby mitigate reservoir risks. EasyCore is designed to speed up the core description process by automating parts of the workflow and still keep a design that is pleasing to the eye. The viewport is WYSIWYG (What You See Is What You Get) and the projects can be exported to a large variety of file formats, plotted to a multitude of supported plotters/printers and saved out both as an internal EasyCore project, commonly used raster file (TIFF, JPEG, PNG and many more) and a series of vector files (pdf, EMF, CGM). This allows for easy integration and embedding in other standard applications. Import core photographs and/or hand drafted core descriptions. Efficiently digitalize and graphical representations of core description. 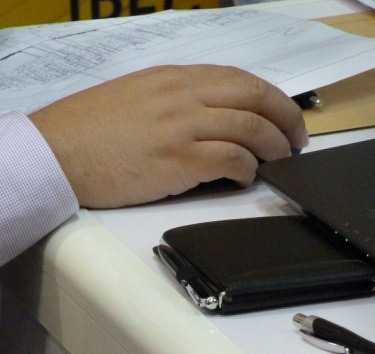 Graphical and digital descriptions of all parameters, stored as real digital data. Fully customizable columns for easy and quick creation of all core description data types. EasyCore is one of the best applications to enable you to store, organize and present sedimentological data in a clear and systematic way. EasyCore is developed in close cooperation with senior sedimentologists.